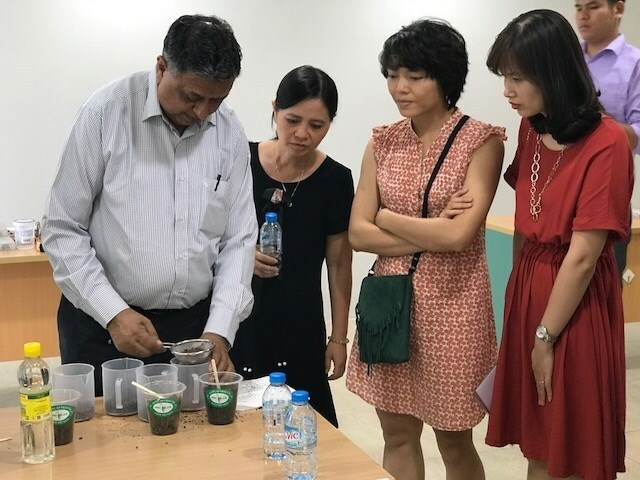 Hanoi (VNA) - A training workshop for teachers of the Global Learning and Observations to Benefit the Environment (GLOBE) 2017 programme was held on August 29 in Hanoi to help launch the programme in Vietnam. The event was organised by the Vietnam Space Centre of the Vietnam Academy of Science and Technology, the Asia-Pacific GLOBE office and the Centre for Education and Development (CED). It provided secondary and high school teachers in Hanoi with knowledge about environmental topics such as atmosphere, soil and hydrosphere, said Vu Anh Tuan, National Coordinator of GLOBE programme in Vietnam. GLOBE, sponsored by the US’s NASA, is an international science and education programme. It consists of 112 countries who together train 58,000 teachers and 1.5 million students to engage in data collection that improves their understanding of Earth’s environment. The Vietnam Academy of Science and Technology and NASA signed a cooperation pact to launch GLOBE in Vietnam in 2015. It is expected to offer students opportunities to participate in scientific processes and encourage their creativity, said To Kim Lien, Director of CED.